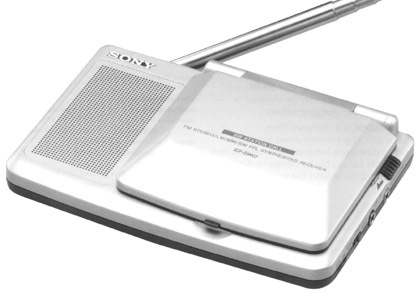 The Sony ICF-SW07 changes the shape of worldband. Don't let the diminutive size and different shape fool you. The ICF-SW07 is packed with features and performance. Frequency coverage is 150 to 29999 kHz to include all longwave, medium wave (AM) and shortwave frequencies. 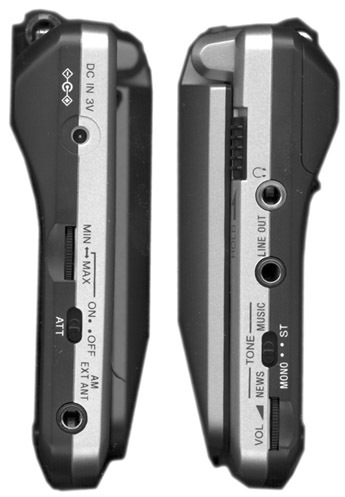 FM stereo is provided to the earphone and line out jacks on the side of the radio. The dual conversion shortwave circuit supports 1 kHz readout for precise tuning via the up/down buttons, scanning or 80 user-defined alphanumeric memories. A new feature called SW Station Call Tuning (VOA/BBC/DW/Other) automatically chooses frequencies used in your time zone from the removable ROM data module. 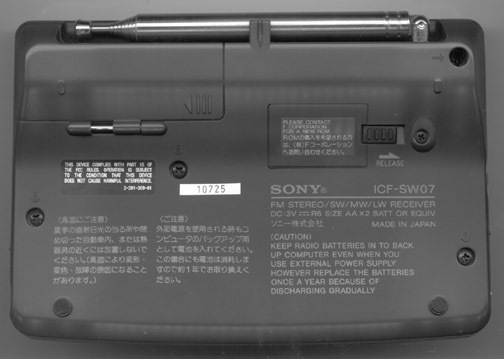 The ROM is user accessable through a door on the bottom of the radio. Other refinements include: synchronous detection, SSB single sideband reception, tone switch, keypad entry, lock, 24 hour clock timer, sleep timer, variable attenuator, external antenna jack and backlit display. This radio can operate with the cover closed. 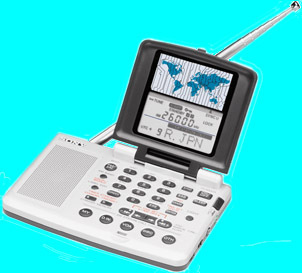 Supplied accessories include: carry case, AN-LP2 active loop antenna, Sony Wave Handbook, AC adapter and stereo earphones. 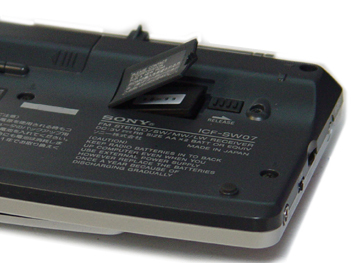 Requires two AA cells (not supplied). Silver and gray case. Only 5.4 x 1.3 x 3.6 inches 9 oz (137x33x91mm 257g) when closed.